An “i can’t believe it’s vegan” Chocolate cake | "But what about..."
Many of my vegan friends are constantly trying to get their families, friends and partners to try their food and a lot of the time it is tried, but with a great eye roll and a ‘yes, very nice’. I found a lot of the cakes I have tried, which are vegan friendly, are either quite dry or are not baked. Not that the cake needs to be baked to be a cake, but there is a definite consistency difference between a raw food cake and a baked cake. 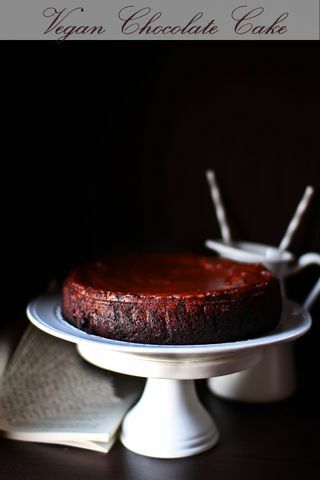 Too, a lot of the time you will find vegan cakes to be slightly dry or lacking something, so that is why this cake has a delicious chocolatey syrup on top to keep it moist. This recipe I have had in my mythical recipe store for eons, given to me by a lovely person who’s name is in the title. I really hope you enjoy it as much as I did, and do, this cake is a shining beacon of light for veganism. Line your baking tin, I use a 20cm round one, with baking paper and preheat the oven to 180 degrees Celsius. Combine your dry ingredients for the cake in a bowl and mix then together. In a jug, mix the water, oil, vinegar, and vanilla and then add that to the dry ingredients. Stir in the chocolate and then pour it into the tin. Bake for around 25-30 minutes until a skewer inserted into the middle of the cake comes out clean. So when the cake it ready, take it out of the oven and (leave it in the tin) poke teeny holes in it with a skewer. While it is STILL WARM, gently pour over the syrup and allow it to cool completely before you take it out of the tin. I hope you enjoy the cake 🙂 It might not really be good for your pocket money, but a lot of it should already be in your cupboard less the chocolate. It is definitely worth the luxury of the chocolate purchase. Sounds delicious! I also had a lot of problems when I tried out vegan baking, but after I got used to the ingredients it got easier:) I’m always happy to see a recipe that I can try out and offer the cake to non-vegans (and they will like it:)) Thanks for sharing!